The Chesapeake Light Tower stands 13 miles offshore in the Atlantic Ocean off Virginia Beach. This steel, "Texas style" tower was built in 1965 and is 120 feet tall. 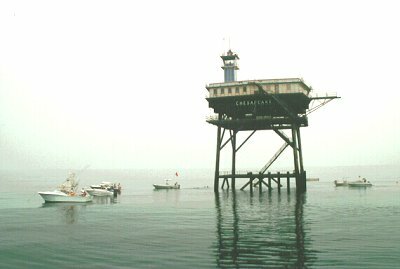 The tower is supported by four 33 inch concrete filled steel pilings driven 180 feet into the ocean bottom. This so-called Texas tower was an adaptation modeled on the offshore oil drilling platforms first employed off the Texas coast. The actual light tower stands 37 feet above the helicopter deck. This light was previously a manned-station and has been converted into an automated station. It is also the site of scientific experimentation to collect data on ocean properties and weather. It is part of the NOAA system. You can check the current Atlantic Ocean conditions by clicking on the here. The Lightship Chesapeake, now located in Baltimore, served at this location beginning in 1933. The lightship stayed on location until 1965, except during World Was II, when the tower was built.